It’s fair to say I can no longer use “writer’s block” for the lack of activity on my blog recently. I’ll come out and confess that it’s pure laziness. But I don’t mind because I’ve been distracted by things that are good for me. For example, I’ve been seeing a personal trainer for about a month now and it’s put my head in a wonderful space. So, I forgive myself for not posting as regularly on here and I hope you all forgive me too. When CaseApp contacted me, I was thrilled about receiving a new laptop skin and phone case and couldn’t wait to get started! CaseApp are a Swedish brand who make high quality custom phone cases and laptop skins. They have a large range of set designs but what makes them stand out is the fact you can design your own! So if you’ve ever wanted a cute photo of your dog on your phone case so you can look at it all day long, you can! For some reason, having a pretty skin on my laptop makes my desk so much more aesthetically pleasing! I always have a case on my phone but having the chance to design my own was so much fun! I went for a botanical theme but I chose one of the pre-designed skins for my laptop and I love it! It’s so sleek and classy. 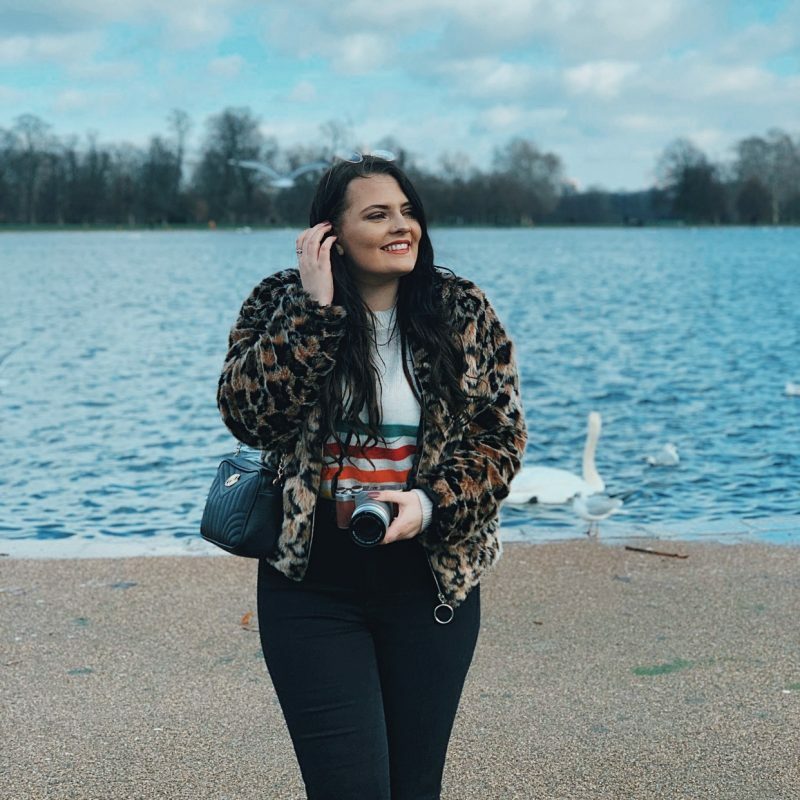 As I previously mentioned, having a tidy desk can help to drive creativity and that’s so important when you write for a living because it’s so easy to become un-motivated and distracted by social media! I live in a constant state of procrastination where I KNOW I have to do something but I will literally do anything else to avoid doing said task. A prime example would be when I was doing my dissertation in my third year of uni, I got hooked on “Four In A Bed” and used to spend hours watching it purely to avoid writing my biggest uni assignment ever! 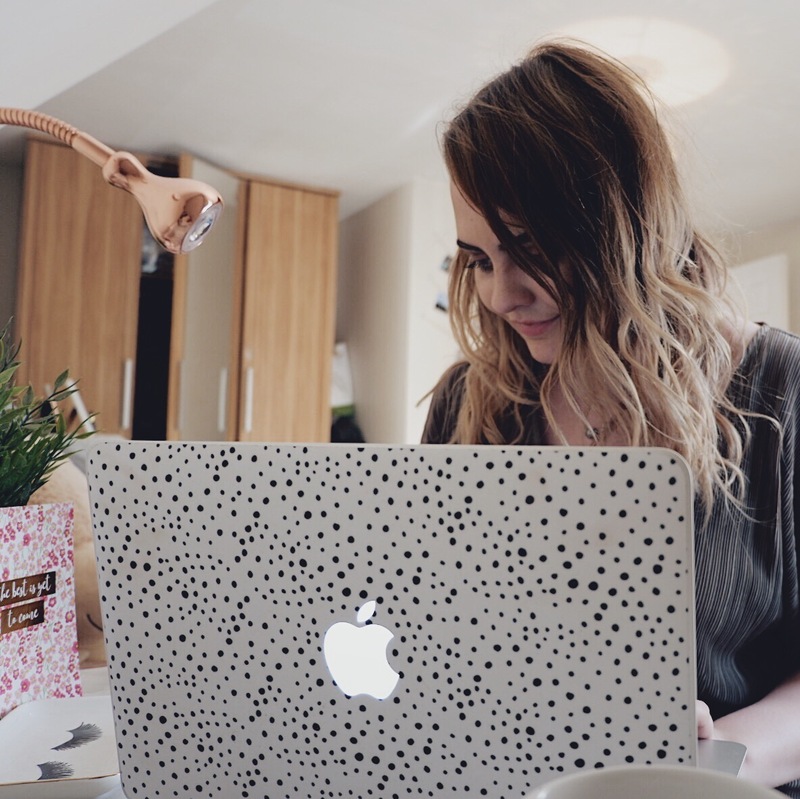 I try to make a conscious effort to keep my desk tidy at work but also at home too! 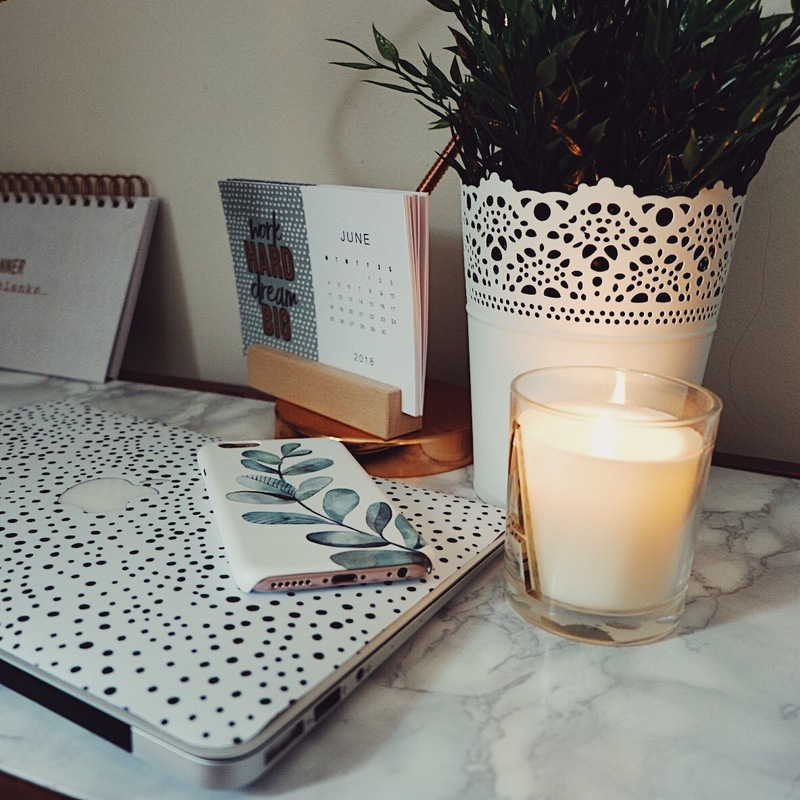 A lot of the time, I write my blog posts in bed or on the sofa and rarely sit at my desk but when it’s tidy, I love sitting there with a candle lit and a good playlist on! 49% said an untidy workspace affects how they feel about going into work each day. Office workers with tidy and organised desks are… 53% in control, 52% more productive and 48% happier! 31% said a messy desk increases stress! Get a few pencil pots and a desk organiser, even if you’re piling your paperwork onto that – it makes your desk appear a lot tidier! And if your pens are in pots, you won’t need to search high and low for your favourite black biro! Every so often, look through the papers and notes on your desk and if they’re from months ago and you’ve not looked at them in a while, shred them! Just before you leave at 5pm, whizz around your desk with a wet wipe and make sure everything is neat and tidy for the following morning. Desks seem to collect dusk quite quickly so if you have a little tidy-up every evening, it’ll be easier to keep on top of things! * This blog post was written in collaboration with CaseApp who gifted me the laptop skin and phone case. I love clearing my desk on an afternoon… Cos then I know it’s home time haha! It’s so true though, a clear space leads to a clear mind. I love that leafy phone case! I can’t focus on anything if my environment is messy. It’s so important to have a decluttered and stress-free zone to get your best work done!